WSU is the only university in the U.S. with a production‑scale CLT manufacturing system. Washington State University researchers are working with a Port Angeles nonprofit organization to develop new housing materials from heat‑treated wood and recycled carbon fiber used in Boeing airplanes. 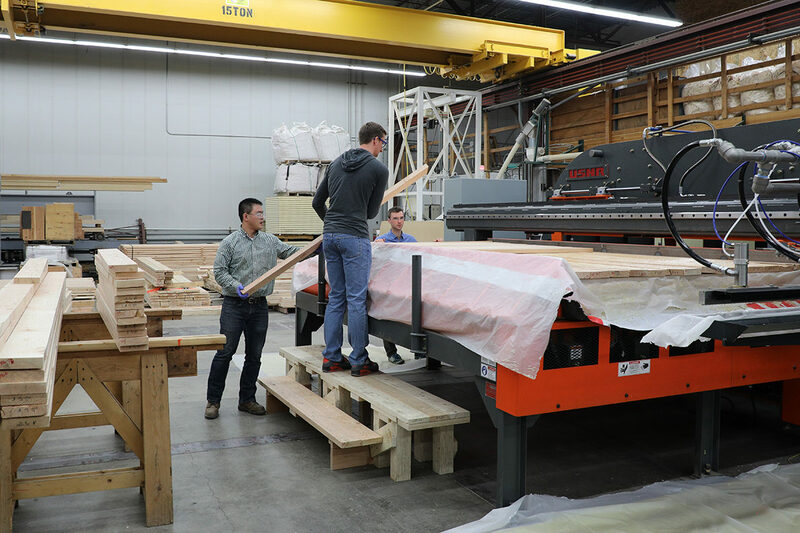 Researchers from WSU’s Composite Materials and Engineering Center (CMEC) are assisting the Composites Recycling Technology Center (CRTC) in Port Angeles to produce construction‑grade cross‑laminated timber (CLT). A demonstration panel for the first phase of the project will be on display from March 19–21 at the 2019 International Mass Timber Conference in Portland, Ore.
Cross‑laminated timber is a relatively new building material in the U.S. that has significant advantages in sustainability over many traditional housing materials, said Don Bender, CMEC director and Weyerhaeuser Distinguished Professor in the Department of Civil and Environmental Engineering, who is the lead investigator for WSU. CLT can be made from small‑diameter timber that is thinned from forests to improve forest health and to reduce wildfire risk. Using the timber in CLT, instead of allowing it to burn, reduces polluting carbon emissions that contribute to global warming, said Bender. To convert the timber to a more durable, stable construction material, the researchers are investigating thermally modified lumber. Thermal modification makes the wood more resistant to decay, and less prone to shrinking and swelling as the moisture conditions change. Its compact layering also creates an air tight building material, which can reduce a building’s energy usage and costs. Furthermore, CLT panels are prefabricated with little waste on site. Because CLT can be erected quickly, it also makes for an ideal building material for buildings that require simple and fast construction, ranging from schools to disaster shelters. Thermal modification of wood slightly reduces its strength, so the researchers will be adding recycled carbon fiber to CLT to restore the strength. Recycled carbon fiber costs about one‑tenth as much as virgin fiber. This project comes amidst growing excitement about wood‑based construction in Washington state. The state’s building code council has recently allowed the structural use of cross‑laminated and other forms of mass timber in buildings as tall as 18 stories. Governor Jay Inslee also recently signed a bill that encourages state and local governments to include mass timber construction in local building and zoning codes. “Now suddenly timber is an option for mid‑rise buildings,” said Bender. The first real‑world application for the carbon fiber‑reinforced wood composite created for the project will likely be military housing. The project’s end goal is development of a new manufacturing facility on the Olympic Peninsula, which could create as much as 50 new jobs in the region. Port Angeles, located near the Olympic National Forest, has an abundance of western hemlock trees, which are usually seen as less commercially valuable and could be used for CLT manufacturing. The Port of Port Angeles provided a seed grant for the project. Bender says the project ties into WSU’s mission as a land grant university, serving the residents and companies of Washington state. “We have the potential to create not just new jobs but an entire new industry,” he said. Source: Washington State University, press release, 2019-02-28.